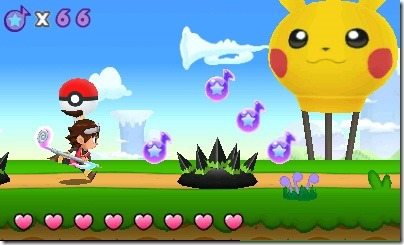 HarmoKnight is the latest release by Game Freak, the developers behind the much-loved Pokémon franchise. 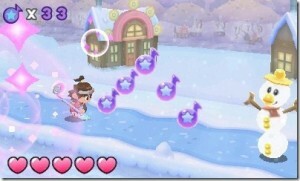 A rhythm game, it was released into the European and North American 3DS eStores on 28/3/13 for £12.99. As with most rhythm games you play by pressing buttons in time with the beat. What sets it apart from the likes of DDR and Elite Beat Agents, however, is that the onscreen visuals deceptively disguise it as a side-scrolling platformer. Hence you are continually moving to the right, and the aforementioned button presses are represented onscreen by jumps and swabs of the protragonist’s adorable note-shaped sceptre. Well, most of the time anyway. 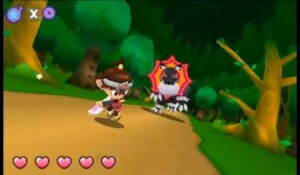 Occasionally you will be expected to play as other characters, and these each have their own set of actions. An example is the archer Lyra who’s actions are either a simple block or a shot of her bow and arrow. Play feels hypnotic, and you really get the impression you are travelling on a journey as you run through the game’s diverse landscapes. The game boasts a longevity that is highly impressive for an eShop title ; it will take you a fair few days before you’ve seen all there is to see, and longer still to master all the levels in fast mode. The graphics are a mixed bag. The worldmap is presented in flat-coloured Flash art which, although highly detailed, does seem a somewhat lazy choice. However this is starkly contrasted with the artwork feats featured elsewhere. The levels are fleshed out in gorgeous 3D with rich, vibrant colours and an abundance of wacky ideas. Everywhere you look you’re bound to see something odd, such as things that shouldn’t be fashioned into musical notes or adorned with faces. Even the flames have faces! 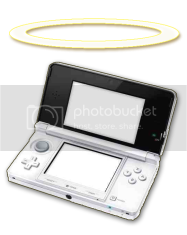 Its all most delightful and demonstrates well the design prowess Game Freak are famous for. Then you have the level intros. These are lovingly painted little title cards which really show the attention to detail which is present through-out this title. As you would expect in a rhythm game the music is top-notch. You’ll find you have the upbeat melodies, such as ‘Steel Drum Summer’ and ‘Clocktower Climb’ stuck in your head for quite some time after playing! The game’s tracks are an absolute pleasure to play along to, and a credit to it. 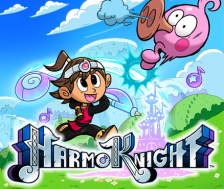 In conclusion HarmoKnight is an utterly quirky yet wholly gorgeous title that is sure to have you glued to your 3DS. An absolute steal at £12.99, it is easily one of the best games on the 3DS and, along with Colors 3D and Tokyo Crash Mobs, goes to show what a gold mine the 3DS eShop is becoming. And if thats not enough there are 5 bonus stages based on tracks from Pokémon!